"I can feel the secrets pushing against my veins, and in turn, I push right back--hiding them deep inside, where I hope one day even I won't be able to find them." Goodreads Summary: May contain spoilers if you have not read Throne of Glass. First Thought After Finishing: Holy game changer, Batman! This fantastic story just got a lot more interesting. 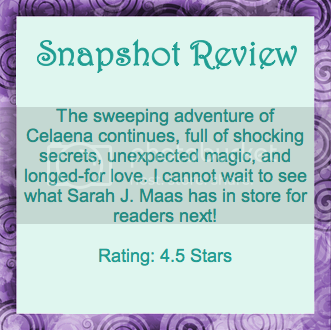 Celaena is back with all of the favorite characters from throne of Glass. After overcoming all of her trials, she's hoping life can settle down. 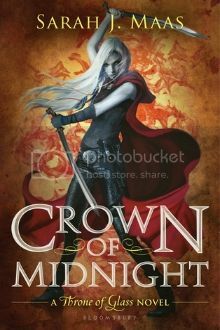 Instead, she's being used more than she would like as an assassin, she has otherwordly orders to discover a secret about her king, and she has to work out her feelings about Chaol. As it turns out, there is no rest for Adarlan's Assassin, and only more fighting to come if she is to have any hope of peace. I started this book having not read Throne of Glass for years. A few of the details were fuzzy, but for the most part, I remembered the story--a tribute to the brilliant writing of Sarah J. Maas. Everything I loved about the first story was here again. 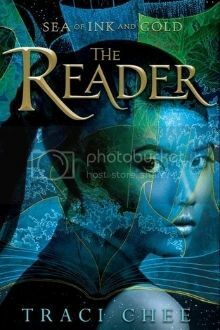 Celaena is still a fierce warrior, only now her battle is focused on those close to her--and on protecting her secrets. In a world full of secrets and long-hidden magic, nobody can be completely honest with others, let alone with themselves. The fighting and the intrigue kept me turning page after page. Then there was Chaol. We get to learn more about him in this book and see much more of his interaction with Celaena, which I loved. Chaol appears to be the strong (very strong) silent type, but there is even more to love. Nehemia is her usual wise, sweet self, and Dorian has to make important decisions about who he wants to be. Several new characters also play an important role. I especially enjoyed the cheekiness of Mort, whose interactions with Celaena were entertaining. This book really began to show the grand scope of this series. I have always loved epic fantasy, and I'm happy that this will be such a complex story. I would hate to say goodbye to these characters or this world anytime soon. Most Memorable Aspect: Chaol. I loved him from the first book, and he remains one of my favorite male YA leads. Goodreads Summary: Sefia knows what it means to survive. After her father is brutally murdered, she flees into the wilderness with her aunt Nin, who teaches her to hunt, track, and steal. But when Nin is kidnapped, leaving Sefia completely alone, none of her survival skills can help her discover where Nin’s been taken, or if she’s even alive. The only clue to both her aunt’s disappearance and her father’s murder is the odd rectangular object her father left behind, an object she comes to realize is a book—a marvelous item unheard of in her otherwise illiterate society. With the help of this book, and the aid of a mysterious stranger with dark secrets of his own, Sefia sets out to rescue her aunt and find out what really happened the day her father was killed—and punish the people responsible. This sounds like a mystery, survival story, and a touch of fantasy all rolled into one. From the description, it promises to be an exciting story! Goodreads Summary: Andie had it all planned out. First Thought After Finishing: Only Morgan Matson could write a 500-page book about a summer with no plans and have such an engrossing story. Andie has always had her future planned out. She want to be a doctor, and even in high school she has her summer program lined up. As the daughter of a US Congressman who is never home, and as a daughter still mourning the loss of her mother, she has kept everyone but her three best friends at arm’s length. However, one mistake by an employee in her dad’s office derails all of her plans. For once, Andie has to go with the flow, piece together something she never would have imagined doing, and figure out a new plan along the way. "Now, being in this moment, on the cusp of something happening, made me wonder why I'd been rushing through it all these years. Or maybe I hadn't. Maybe I'd just been waiting for this moment, right now." Andie’s story reminded me a lot of my own. I always had a plan for what I wanted to do, and I like having all of my ducks in a row. However, when I moved to Salt Lake, I had no definitive plan other than being with my friends. Even though I never would have guessed that my life would go in the direction it has, it has turned out to be really good. That was Andie’s summer—several unexpected, even unwanted, choices that led to a summer she could never have planned if she’d tried. With Andie came a great group of friends, and the friend group expands over the summer. Companions both human and canine had their role to play. While walking dogs, Andie meets Clark, who is exactly the opposite of guys that she would pick for herself but also exactly what the summer calls for. 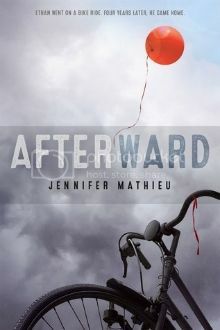 She is around for the ups and downs of her friends’ lives, and she can reconnect with her father. This book wasn’t full of twists and turns, but it was a sweet, real story full of the things that are important in life. Andie had a summer that I would want, with a guy you can’t help but love, and adventures with friends that would make for perfect summer nights. Most Memorable Aspect: The friendships between the characters reminded me of my group of friends. I liked that the group was an actual close-knit group and enjoyed knowing all of the characters. Goodreads Summary: Long before she was the terror of Wonderland — the infamous Queen of Hearts — she was just a girl who wanted to fall in love. 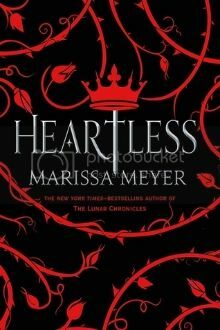 I loved Marissa Meyer's Cinder books, and I love Alice in Wonderland. Putting them together is bound to be a great story! Goodreads Summary: Maria Lyon and Lily Boiten are their school’s ultimate power couple—even if no one knows it but them. I was sold on this story with the mention of Shakespeare. I'm curious to see how black magic or ghosts are woven into a story of revenge! "But he couldn't help imagining it--the glimmer of the future and how it'd be to forge a life together, to call her his wife, to hear her call him husband, to raise a brood of children, who would probably be far too clever and talented for their own good (and for Chaol's own sanity). He was still envisioning that impossibly beautiful future when someone grabbed him from behind and pressed something cold and reeking against his nose and mouth, and hte world went black." Goodreads Summary: May contain spoilers for Red Queen. First Thought After Finishing: That can't be the last page! 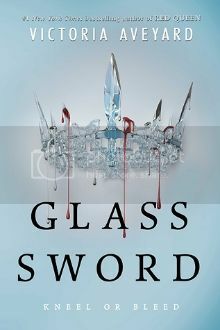 Glass Sword picks up right where Red Queen leaves off, continuing the story in a politically unstable world of Reds and Silvers. Mare has tasked herself with finding all of the other newbloods to keep them safe and help them understand their new abilities. In the midst of her search and her mission to stay one step ahead of a political uprising, she has to try and come to terms with her feelings about two vastly different boys. Once again, I loved the scope and creativity in this series. Just like Red Queen, this book is quite a thrill ride and a guessing game. Even though it isn’t always her intention, Mare lives on the edge of danger, and the adrenaline from flying just under the radar is almost as exciting as the well-crafted fight scenes. The abilities of characters continue to surprise me, and they are used in inventive ways. The romantic side of the story does take a backseat to the action, it doesn’t disappear by any means. So much happens in this book, and it definitely makes me excited to see what will come in the next one. As much as I enjoyed being back in this world, a couple of things stood out to me. Mare was always concerned with reading people, determining if they were lying, and interpreting their thoughts. Sometimes the message of “Anyone can betray everyone” felt a little heavy-handed. Even though the book is filled with secrets and questions needing answers, sometimes it would be nice to figure things out without Mare’s guidance. My only other complaint is the ending—how am I supposed to wait for months until the next book comes out? That’s more torture than Silent Stone to Silvers. Most Memorable Aspect: Cal is the kind of character that you can’t get out of your head. I wish there were chapters from his perspective, because I’d love to know more about him. 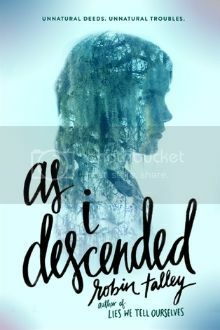 Goodreads Summary: Aspiring reporter Piper Baird decides to write a scathing exposé on the overprivileged students at an elite Washington, DC, school, only for her life to change when she begins to fall for the story's main subject, in this new realistic contemporary romance from Brodi Ashton, the author of the Everneath trilogy. 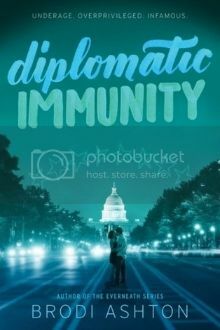 Raucous parties, privileged attitudes, underage drinking, and diplomatic immunity...it’s all part of student life on Embassy Row. Piper Baird has always dreamed of becoming a journalist. So when she scores a scholarship to exclusive Chiswick Academy in Washington, DC, she knows it’s her big opportunity. Chiswick offers the country’s most competitive prize for teen journalists—the Bennington scholarship—and winning will ensure her acceptance to one of the best schools in the country. Piper isn’t at Chiswick for two days before she witnesses the intense competition in the journalism program—and the extreme privilege of the young and wealthy elite who attend her school. And Piper knows access to these untouchable students just might give her the edge she’ll need to blow the lid off life at the school in a scathing and unforgettable exposé worthy of the Bennington. The key to the whole story lies with Rafael Amador, the son of the Spanish ambassador—and the boy at the center of the most explosive secrets and scandals on Embassy Row. Rafael is big trouble—and when he drops into her bedroom window one night, asking for help, it’s Piper’s chance to get the full scoop. But as they spend time together, Piper discovers that despite his dark streak, Rafael is smart, kind, funny, and gorgeous—and she might have real feelings for him. 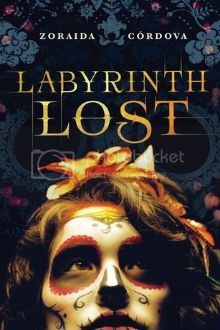 How can she break the story of a lifetime if it could destroy the boy she just might love? 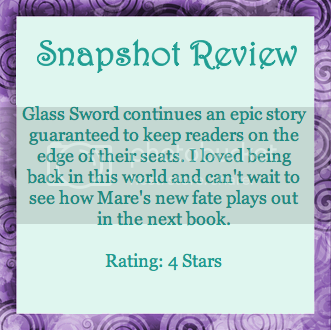 Romance, political intrigue, and an international love interest? Yes, please! 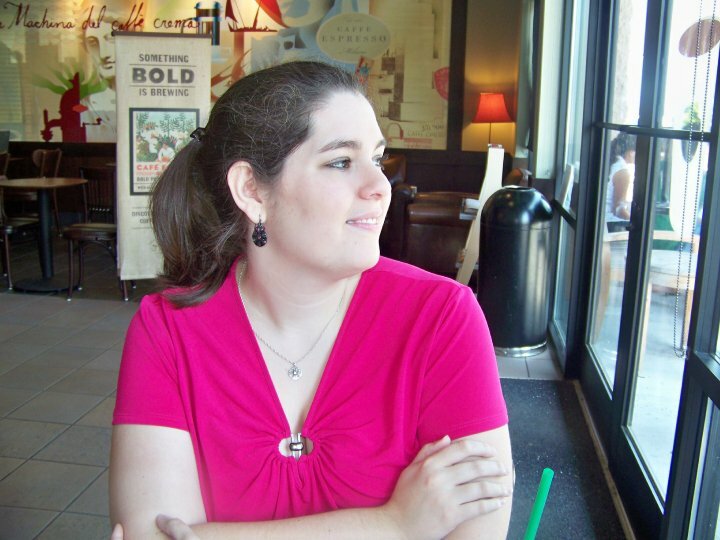 I loved Brodi Ashton's writing before, so I'm eager to see how she does with a new genre!